I remember being enthralled as a kid reading a gun magazine article about BBQ guns. What is a BBQ gun? 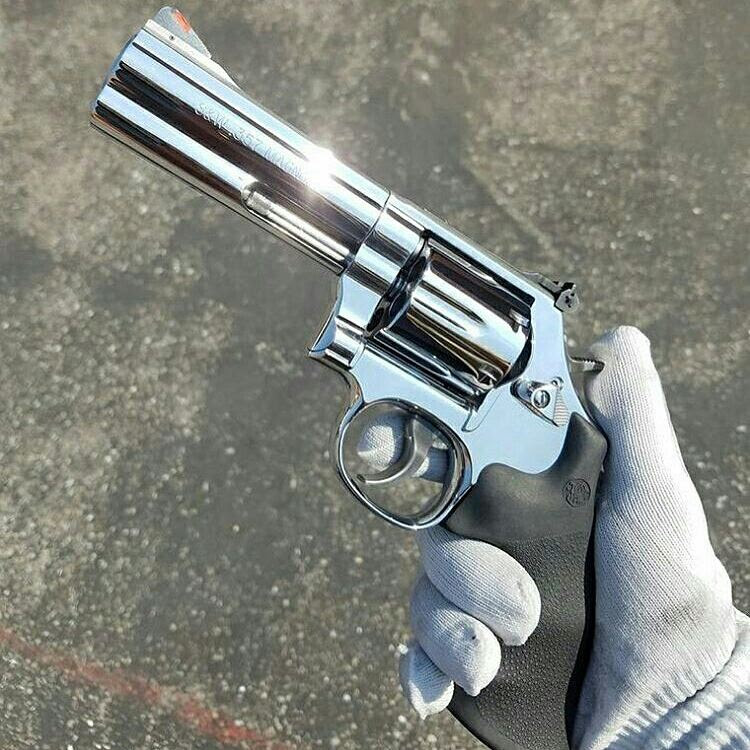 Only the hottest looking revolvers I’d ever seen! There were nickel and gold plated Colt Single Action Army revolvers, Colt Pythons and Smith and Wesson revolvers with awesome scroll engraving work with beautiful grips made of everything from ivory, pearl and exotic woods. They were all wrapped in highly customized holsters made from leather that were open carried to BBQs for everyone to gaze upon. I lusted after one throughout my childhood but I assumed that I was over it when I became an adult. I was wrong. I owned a Smith and Wesson 686 that I use to teach new shooters how to use a handgun and for The 2nd is For Everyone: Diversity Shoot. I am always looking for ways to get people introduced to firearms and I figured a BBQ gun would be just the ticket to get new shooters over being intimidated by a firearm. Pretty guns can’t be scary, right? I looked around to have BBQ gun work done on my Smith and Wesson 686.. I saw really cool stuff from some top gunsmiths but the sticker price was out of this world. The cost of doing this work was in the thousands of dollar range, so I was out. I stumbled across Patriot Gun Polishing’s Instagram page and had my mind blown. The quality of the mirror polishing was amazing and soon I was at Gun For Hire range in Woodland Park NJ having them send my revolver to Patriot Gun Polishing in Florida. Robert, the owner of PGP, sent me a written description of all of the surface scratches that were on my revolver after he looked it over so we were both aware of what he had to work around. The wait for the work was a few weeks and it was killing me! Every day he post pictures of firearms that he is working and they looked great, I was going nuts waiting for my firearm. I received my revolver back in the hard black pistol case that I sent out. When I opened it I felt like the characters in the movie “Pulp Fiction” opening Marsellus Wallace’s suitcase, it positively glowed. Most parts of it was polished to a mirror finish, there was no hint of the scratches that were on the revolver. The end of the barrel and the top strap was left sandblasted,the trigger and hammer were left original.The mirror polishing along with the trigger and action job I’d had done when I purchased the 686 made this BBQ gun THE BOMB! I took this to the very next “The 2nd is For Everyone : Diversity Shoot” to see if new shooters would be impressed by the beautiful revolver. It made an impression on the new shooters but they had nothing to compare it to since it was their first time shooting any firearm. It was more of a big deal to experienced shooters that owned stainless steel firearms. They came over one after the other to look at and shoot my BBQ gun. I know this isn’t an expensive super customized BBQ gun from my childhood but it sure feels like it. I did not to change the grips because this is a training firearm, I want it to be as soft shooting and recoil friendly as possible so I kept original Hogue rubber grips. Clean up seems easier than before, I clean it the same as before I had the work done. I wipe it down with the same micro fiber cloth that PGP sent my revolver wrapped around to keep fingerprints off. The prices for most revolvers are $375, full sized pistols are $575, Commander size pistols are $525 and compact models are $375-$450. All prices include shipping. Robert was good enough to donate his services to 2A4E Diversity Shoots and for that I am very thankful. I have taken many photos of the revolver and used them to spread the word of our 2nd Amendment events. This firearm is very photogenic and tens of thousands of people have seen this firearm on social media. 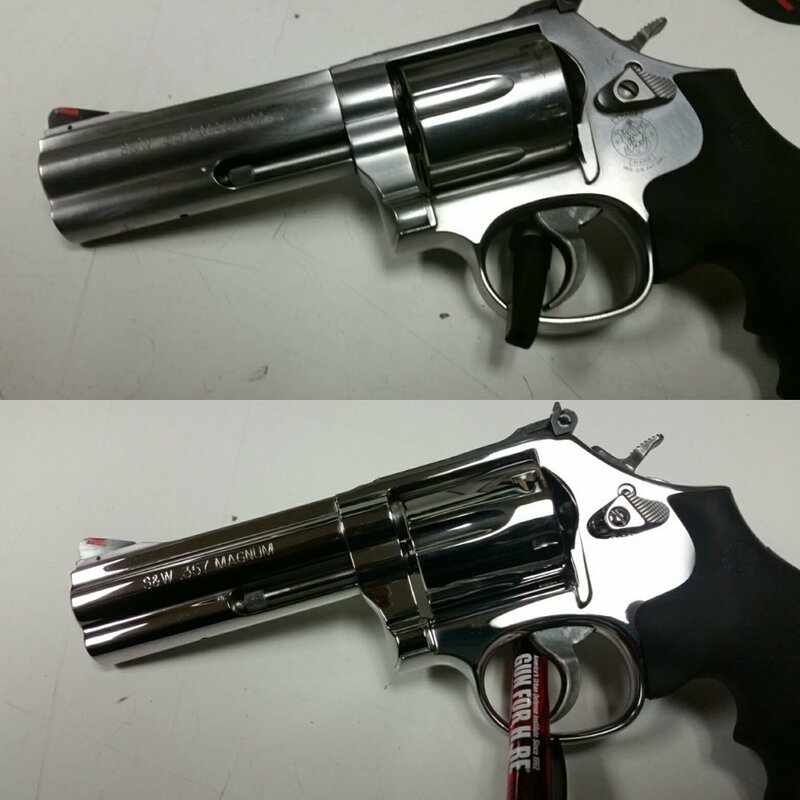 If you want to turn your pistol or revolver into a piece of art then send it off to Robert at Patriot Gun Polishing. Robert is a trustworthy and first class firearms expert. Turn around time was good. Communication was professional. A first class operation! Wow! Top notch service. Master of his trade. I carefully looked my Coonan over for any rounded off edges that aren't supposed to be rounded off. Couldn't find any. Some would say polishing is a bit pricey. It is (no matter who does it) So why pay the same and get less? I know a guy that had his 1911 polished by a competitor. The picatinny rail was rounded off. It looked like waves crashing on a beach. YOU WILL NOT GET THAT HERE! A true craftsman.